I am a human biology major with minors in chemistry and sociocultural anthropology. Among many other things, I want to go through a combined MD/PhD program and ultimately become a forensic pathologist. I grew up in the Santa Cruz Mountains, in a tiny town called Ben Lomond, population 3,000. The downtown area consists of a market, fire station, coffee shop, tavern, and three thrift stores. I played water polo all through high school, and forced myself through swim team to stay in shape for polo. As the goalie, I was one of the best polo players but one of the worst swimmers. What made you want to join the triathlon team originally? 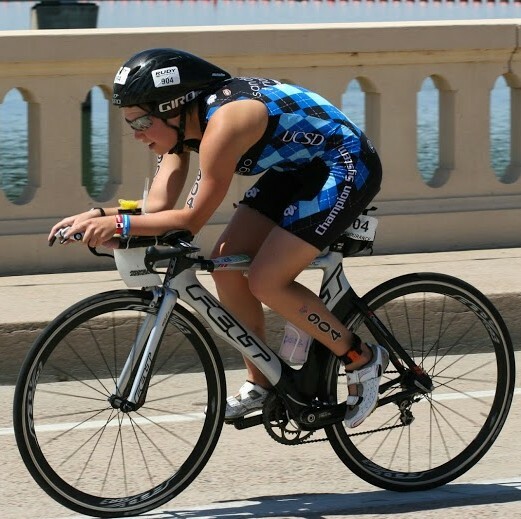 I wanted to try something new in college, and triathlon was about as weird a sport as I could find on this campus. Besides Quidditch; I’ll join that team when they get broomsticks that actually fly. What is your favourite sport out of the three? Biking. Well, running is pretty good too. And even swimming’s not so bad now that I’ve learned how to move my arms properly. I think triathlon is my favorite sport. What has been your best race experience? Nationals 2011. It was my first time competing at a national level, in any sport, and I enjoyed every minute of that four days. Conditions were not ideal and I’m sure many people who were there don’t agree with me, but I had a blast. A water polo game. Nothing beats getting drowned while trying to throw a little yellow ball into a net. 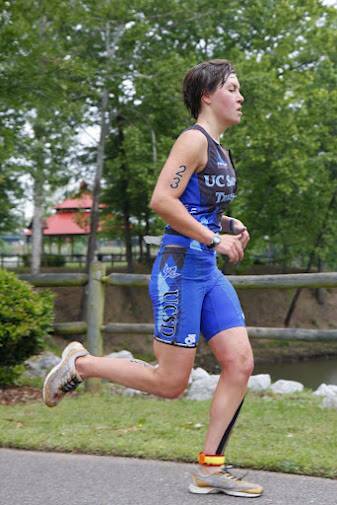 Joanna running hard at her debut national race in 2011 at Tuscaloosa, AL. Wildflower 2012. 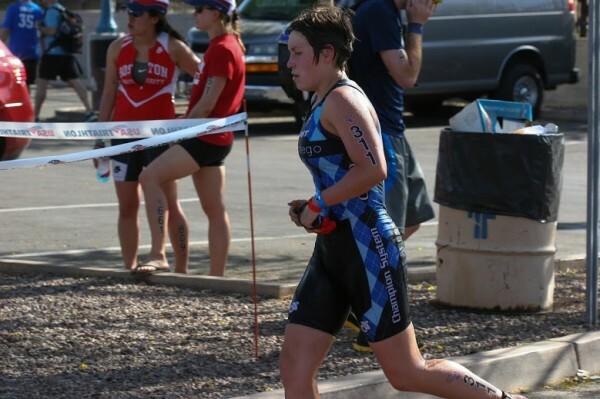 I came out of the water in the top 10 collegiate women, passed some in transition and one on the bike, and maintained my position on the run to end up 5th. By far my best race of that year. Nationals 2011 (again), borrowing race wheels I didn’t know how to take care of. They were tubulars and (of course) got a flat. Chris had to bail me out and glue a new tire to my wheel the night before the race. Academic year: Finish undergrad with a 4.0 (hey, you asked) and avoid any anthropology classes with papers. Triathlon: Come top 30 at Nationals, don’t get a drafting penalty, and don’t fall apart at Conference. I am a die-hard Trekkie, and I’m not ashamed of my love. Are you on social media anywhere? Just Facebook. I have way too much else going on in my life! So, I hear you want to be the next Bones. Is it the FBI boyfriend or the science that draws you to that career? Believe it or not, it’s the catching criminals. I could do anything with a science degree, but this is how I want to use it to help my community. And come on, who could resist an FBI boyfriend? You’re taking 22 units, you’re one of the fastest women on the triathlon team, you are in a serious relationship and are applying for med schools? What can’t you do, and how can you do this all at once? Well, I can’t figure out how to do a flying mount on the bike; the thought terrifies me. As for how I do so much stuff at once, I guess I just enjoy being busy. It can get very stressful, but if I don’t have enough to occupy my time I get bored. Once you graduate from college, what are your plans? Will you take a gap year, will you continue to race triathlons, or will you find something new? I’ve got so many things I want to do after undergrad. I want to enter an MD/PhD program (8 years long, for both an MD and a PhD degree), but before that I’m definitely taking a gap year. I applied for a scholarship to do research in England for a year, but I didn’t get that. So I’m considering getting a master’s in forensic science instead, or doing a post-bac research program. If the cards fall correctly, it would be great to qualify for Kona. And next summer? Definitely want to do a bike tour of western Europe.